something that she wants to hide. what does bare face even mean? Let’s have a quiz at this moment. For this photo, when did she take it? If so, then how about this photo? The correct answer will now be revealed. is as much as 8 years. Sandara Park was born in 1984, and this year she’ll be turning 33 years old. When she debuted in 2009, she was already 26 years old; it’s been 8 years since she debuted as an idol. She’s called the best “baby face” among girl groups. Let’s first take a look at Sandara Park while she’s on her way to work. On this day, she would make her first appearance at the filming site. Wearing a red tteokbokki coat, she showed her fresh visuals. Preparations for the filming of “Get It Beauty 2017” have started in earnest. The formula ‘cosmetic maniac/addict = shade/tint maniac/addict’ was created for Sandara Park. We focused more on inner beauty. Have you ever heard of inner beauty before? To put it simply, it’s cosmetics that one can ‘eat.’ Intake like collagen, vitamins, and others that, when taken, are good for the skin. Now, here comes the MC test. 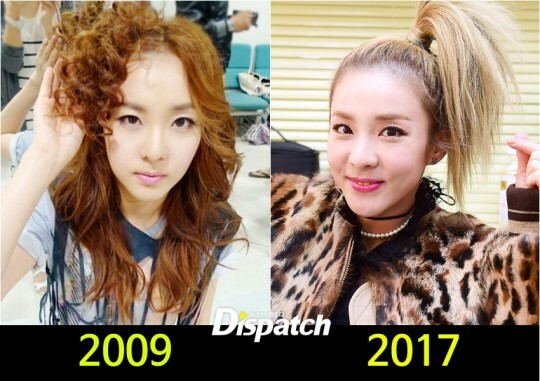 We wanted to check Sandara Park’s self make-up. She went back up on stage shyly with a black mask. 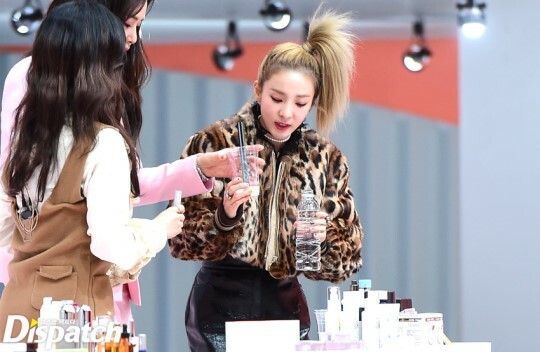 Sandara Park has released her self make-up know-how. From dealing with dark make-up to lively ball (T/N: cheek balls) touch…. The art of doing make-up. Successfully finished the first filming. This time, we sought Sandara Park at the waiting room. From now on, we will be revealing her beauty tips for “Entertainment Special” readers. Q. We’re wondering when you first started your inner beauty regimen. A. It started out naturally when we were doing ‘2NE1’ activities. If there was a pimple, we’d look less pretty even with make-up. It’s something that I thought would have to be addressed from the inside first. Q. What’s the inner beauty item that you use the most? A. There’s a tonic that I use that prevents my face from swelling. The principle is that it helps regulate and quicken blood circulation, which prevents swelling. Even if I ate ramen the previous day, my face doesn’t swell. Q. It seems that you have a strong attachment to maintaining inner beauty. A. That’s right. When I find something good, I tend to buy a lot of it all at once. Some may call it hoarding. 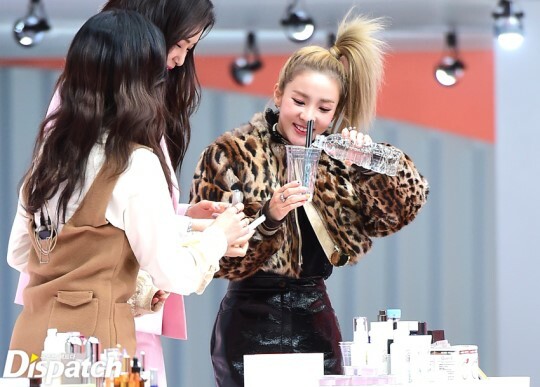 The people call around me call me “All-Sandara” (T/N: because she buys “all” or a huge bulk when she likes something). Haha! Q. So that’s the reason why your skin is so good. It’s Inner Beauty going hard at work. A. Basic care is important as well. There are only 5 important and basic cosmetics that I use in the evening. Toner, serum, eye cream, essence, and moisturizing cream. Q. You use them everyday? A. I apply them before going to bed everyday. I take special care for dry days like the ones we have recently. When I get up in the morning, the situation feels improved and my skin feels glowing. Q. How about daily make-up? A. I rarely put on make-up. When I was doing activities with 2NE1 though, there wasn’t any make-up that I hadn’t tried. However, I stopped putting a lot after. Q. Then how about self make-up. A. There really isn’t any special point to it. First, apply a thin layer of BB cream. Skip the eye make-up. 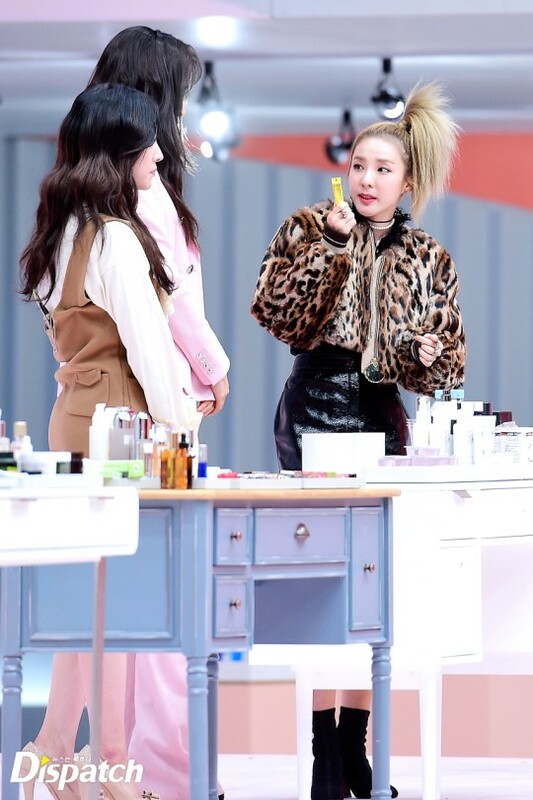 Then put on some blusher and a lip tint with lively color, and that is the end of Sandara make-up. Isn’t it really easy? Q. What item are you most fond of? A. Items for lips! However, I don’t know what color suits me the best. But it depends on my mood at the moment, I often use pink and also put on orange sometimes. It’s something that you can apply all throughout the year. Q. Last question, what made you decide to join “Get It Beauty 2017” as an MC? Sandara’s beauty know-how, did you watch it well? For more detailed beauty tips, please stay tuned to “Get It Beauty 2017” on the 19th, at 8:20PM.